The primary way that Concourse jobs will be triggered to run will be by resources changing. A git repo has a new commit? Run a job to test it. A GitHub project cuts a new release? Run a job to pull down its attached files and do something with them. Triggering resources are defined the same as non-triggering resources, such as the resource-tutorial defined earlier. The difference is in the job build plan where triggering is desired. By default, including get: my-resource in a build plan does not trigger its job. In the above example the job-demo job would trigger anytime the remote resource-tutorial had a new version. For a git resource this would be new git commits. The time resource has intrinsic purpose of triggering jobs. If you want a job to trigger every few minutes then there is the time resource. Now upgrade the hello-world pipeline with the time trigger. This adds a new resource named my-timer which triggers job-hello-world approximately every 2 minutes. 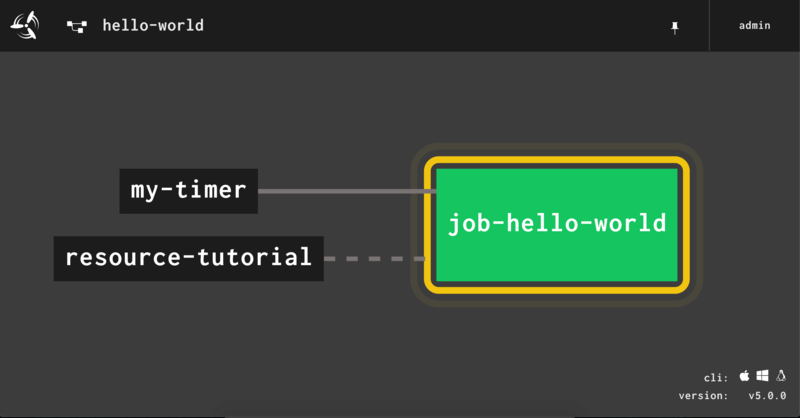 Visit the pipeline dashboard http://127.0.0.1:8080/teams/main/pipelines/hello-world and wait a few minutes and eventually the job will start running automatically. The dashboard UI makes non-triggering resources distinct with a hyphenated line connecting them into the job. Triggering resources have a full line. Why does time resource configured with interval: 2m trigger "approximately" every 2 minutes? The net result is that a timer of 2m will trigger every 2 to 3 minutes.